Our Abpromise guarantee covers the use of ab36791 in the following tested applications. This protein lysate contains the commonly used epitope tags: HA, c-myc, Glu-Glu, GST, 6-His, HSV, T7, V5, VSV, E-tag, S-tag, FLAG (TM). These proteins were fused in the following order, GST, T7, HSV, c-myc, VSV, Glu-Glu, V5, E-tag, DYKDDDDK, S-tag and HA, 6xHis. This product is a bacterial lysate provided in1 x reduced SDS-PAGE loading buffer. It is effective as a positive control for epitope tag antibodies in immunoblotting. For Western blotting, the suggested use of this reagent is 0.5 - 2.0 µl. It is recommended that the reagent be titrated for optimal performance for each application. Publishing research using ab36791? Please let us know so that we can cite the reference in this datasheet. 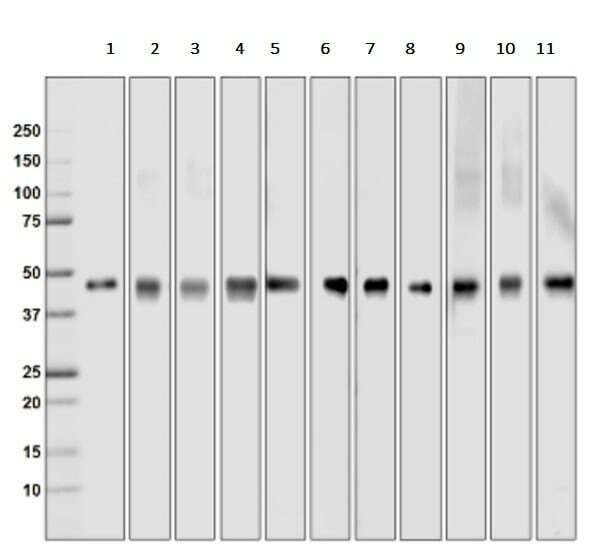 I am planning to quantify a myc-tagged protein in a lysate by Western Blot. I am thus wondering if product ab36791 (multi-tag refernece protein) is a purified recombinant protein that comes at a specific (lot-specific) protein concentration or is it just a bacterial lysate? I confirm that the multi-tag protein ab36791 is prepared from the whole bacteria lysate, therefore the concentration cannot be determined. The recommended usage of this product is between 0.5 and 2 µl per well for a standard western blot procedure. ab36791 Multi Tag protein Can you clarify the following: 1) Are the different tags sequentially tagged to a protein or? 2) Is there a spacer sequence between each tag? 3) Are the tags just tagged to one protein or to different ones? 4) What protein(s) is being tagged? 5) Do you have a WB image of this product with use of the different tag-antibodies? Thank you for your patience in this matter. The originator of ab36791 has informed me that the tags are sequential and that they are attached to a 41kDa recombinant protein. We will soon add a WB image to the product datasheet. I hope this information helps.